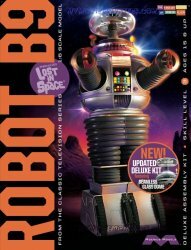 From The Fantasy Worlds of Irwin Allen and Moebius Models comes the Robot B9 from the beloved 1960s sci-fi TV show Lost in Space! This is the Updated Deluxe Kit featuring a seamless glass dome! 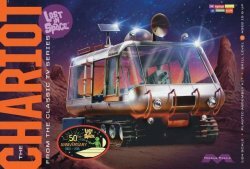 This 1/6 (1:6) scale model comes packaged in a colorful box, with Lost in Space "New! Updated Deluxe Kit featuring Seamless Glass Dome" sticker on shrinkwrap. Collectors Note: Brand-new and factory sealed. Skill Level 3. Recommended for ages 15 and up. Paint and cement not included. Check out our other Moebius and Pegasus model kits and display models!